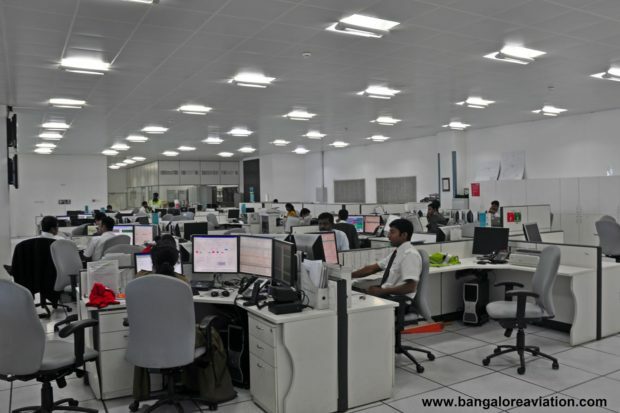 Sitting directly opposite the western-most arrivals gate, in plain sight and yet missed by most passengers is the hidden nerve centre of Bengaluru International Airport (BIA) – the Airport Operations Control Centre or AOCC in short. The AOCC is the command, coordination and control centre for the whole airport which brings together the diverse processes relating to the three major operational areas — passengers, baggage and cargo, and aircraft. Mumbai’s Chhatrapati Shivaji International Airport was the first AOCC in India followed by Hyderabad’s Rajiv Gandhi International Airport. Despite not being the first in the country, the AOCC at BIA has leapfrogged all to become the first and only truly participative AOCC in the country, which in turn has helped the airport bag the prestigious CNBC-Awaaz award for the best managed airport in India. At any airport in the world there are three main processes i.e. passengers, baggage and/or cargo, and aircraft. Within each main process there are plenty of sub-processes and there are overlap between all the processes. Multiple agencies are involved. Airlines, ground handlers, cargo handlers, fuelling, air traffic control, terminal operations, maintenance, security (airline, terminal, airside, land-side, airport), parking, sovereign functions (customs, immigration, commercial taxes, etc. ), VIP handling, etc. The list is very long. Even with the high levels of standardisation prevalent in aviation industry, these are at a macro level and each agency as an individual organisational unit, has their own methods of doing a given process. For example, Air India carries a fire extinguisher with the push back tractor while an airplane is starting its engines. Since BIA is equipped with a fully functional ARFF (Air Rescue and Fire Fighting) station which calls for a maximum two minute response time anywhere in the airport, this is not necessary, but given the numerous small airports Air India operates at across India and the movement of staff, one can understand the standardisation of the process within Air India. Each organisation at the airport has its own objective and goals, and sometimes this impacted the overall process or sub-process. There was no common focus and the ultimate loser was the customer — the passenger or the air freight user. Each country took are different approach to this free for all situation. Some acknowledged the problem and took coordination action, some did not acknowledge the problem at all. The United States acknowledged the problem and tried to fix it by regulation. In India, in true government style, the problems were acknowledged by the Airports Authority of India, but no action was taken. Airport operators across Europe modified the collaborative decision making (CDM) philosophy used by Eurocontrol, for airports calling it airport CDM (ACDM), and began the start of the AOCC using a as we know it today. Bengaluru International Airport, with its airport management from Zurich airport, has implemented the European style of AOCC. It is important to note, due a variety of reasons, mostly because there was no European Union at the time, there was no government regulation forcing the collaborative decision making or the AOCC, the whole process was voluntary participation. In contrast, the United States with a large monolithic land mass and a massive aviation industry, which allowed for common regulation, has gone on to develop very advanced central flow management units at airports which function using collaborative decision making at extremely advanced levels, enabling some of the highest infrastructure utilisation levels in the world. Be it the collaborative model of Europe, or the mandated model of the United States, the common thread across all AOCC’s is information. All information is the same, and all stake-holders put their inputs and information in to a common repository and each stake-holder takes out their piece(s) of needed information resulting in better decision making, lower disruptions, and seamless operations. All of this is done on a real-time basis. As expected there was complete apathy in India to the concept of collaborative decision making. It was not limited to only the sovereign functions like security, customs, immigration, security and air traffic control, but also airlines, since most of them do their own ground handling. The Unique Zurich airport management team commenced the Bengaluru International Airport Airport Operations Control Centre with two main objectives in mind. Synchronise all processes and sub-processes that happen on the ground to ensure a well structured slot allocation mechanism. Establish an on-ground control centre for the air. 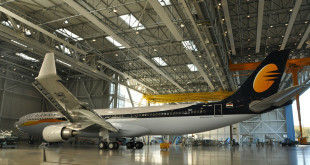 Improve air space management which depends on accurate demand forecasting and ground resource availability information. Since current information sharing was weak, establish coordination between the AOCC and the Air Traffic Control (ATC) to improve and maximise efficiency on air operations and slot allocations. Keeping to European traditions, the BIA AOCC is based on voluntary participation in the airport collaborative decision making (ACDM) process. Contrary to popular expectation, the one airline that was gung-ho on ACDM and has participated in the AOCC from day one is, Air India. Air India already had a well established internal coordination cell, similar to the AOCC but at the airline level. This cell used to coordinate all the various internal department to ensure flight operations. After Air India, Kingfisher joined the AOCC and after that Jet Airways and JetLite. IndiGo has joined the AOCC only about a month ago on a trial basis. Foreign carriers are handled by the dedicated ground handling companies Air India-SATS (AI-SATS) or Globe Ground India (GGI), both of whom participate in the AOCC. The AOCC today covers 80% of domestic flights and 100% of international flights at the airport. The AOCC commences its macro level planning at a seasonal level. In the aviation world, October 28 marks the start of northern winter season, and March 28 the northern summer. 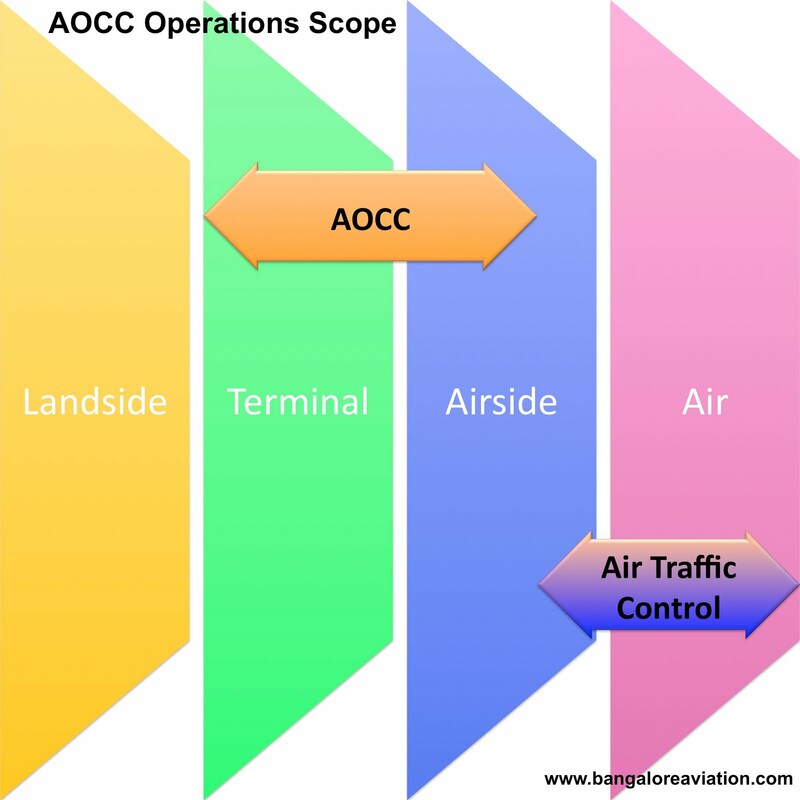 For the season the AOCC stake-holders and air traffic control gather and discuss and prepare a high level operations plan which includes full operational details including slot allocations, etc. These high level seasonal plans are used as a master-plan to perform daily operations plans. The plan covers all operations from 05:00 local to 04:59 the next morning. Each morning, while we are snug in bed, at 03:00 (yes, 3am), the stake-holders gather and discuss the daily operations plan and if there is anything out of the ordinary. May be a new aircraft which requires a water cannon salute, or may be a VIP, who most Indians regard as a very intrusive person (sic), or a special aircraft movement like the behemoth Antonov An-124. 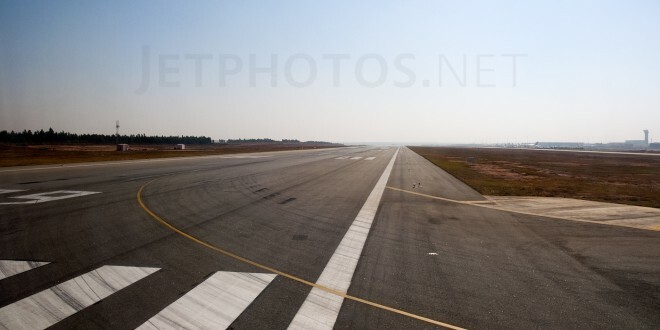 Airport ground resources such as parking stands are allocated on a dynamic basis based the various GMPT inputs. The GMPT also allow airlines and ground handlers to allocate staff and ground handling equipment, sovereign functions like customs to allocate staff, and cargo terminals to plan loading and off-loading of cargo. The end result. Bengaluru International Airport has been adjudged as the “best managed airport” in the country. On time departures are above 94%, one of the highest in the country, while on time arrivals still lag at around 76%. “On time” is considered within 15 minutes the scheduled time of arrival or departure. Airlines love Bangalore. Thanks to the AOCC, the synchronisation and resultant efficiency are so high that the airport helps airlines recover about 85% of their delayed flights. i.e. if a flight arrives 20 minutes behind schedule, the following flight of the aircraft leaves Bangalore only 5~10 minutes behind, helping the airline recover those precious 10~15 minutes. Passengers love Bangalore since their baggage arrives on the belt typically within seven minutes of “on block” for domestic flights and they can leave the airport quickly. The owners love the AOCC since it improves the bottom line while happy airlines operate more flights and help improve the top line. Indranil Gupta, who heads airside operations at BIA and the AOCC, is optimistic. His goal is to take the AOCC beyond the ACDM model in to Total Airport Management (TAM). Something akin to Total Quality Management practised by global leaders in manufacturing, the TAM model will fine tune the synchronisation of all airport operations and tie-in all air and ground processes along with all stake-holders in to a complete chain all the way to back-end systems like yield management, airspace management, etc. The ultimate goal is to implement SWIM or system wide information management, which also happens to be a key component of the Next Generation Air Transport System the United States plans to implement between 2012 and 2025. 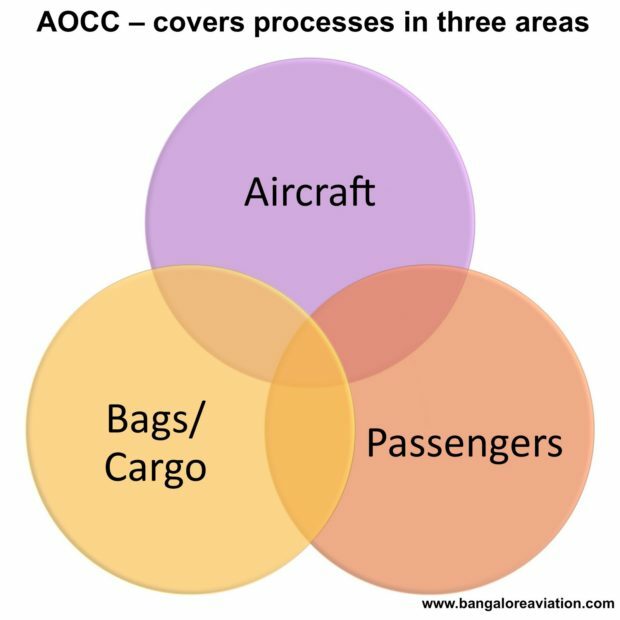 In case Bangalore Aviation readers would like to visit the AOCC, please leave a comment. We cannot promise for sure, but we will try and organise a trip if possible.